Extinction Dialogs: How to Live with Death in Mind is a candid conversation between Guy McPherson and Carolyn Baker. The text addresses the scientific research regarding abrupt climate change as well as how humans who grasp the likelihood of near-term human extinction can prepare emotionally and spiritually for the demise of many species on Earth, including ours. Synthesizing scientific and psycho-spiritual perspectives, McPherson and Baker provide a manual for understanding our terminal status and therefore allow this knowledge to shape every aspect of our relationships and behavior in humanity's last hours. Carolyn Baker, Ph.D. is a former psychotherapist and professor of psychology and history. She is the author of Collapsing Consciously: Transformative Truths For Turbulent Times, Navigating The Coming Chaos: A Handbook For Inner Transition (2011) and Sacred Demise: Walking The Spiritual Path Of Industrial Civilization’s Collapse (2009). Carolyn offers life coaching for people who want to live more resiliently in the present as they prepare for the future. 2013, Publish America, Baltimore, Maryland. We are the last individuals of our species on Earth. How shall we respond? How shall we act? If industrial civilization is maintained, climate change will cause human extinction in the near term. If industrial civilization falls, sufficient ionizing radiation will be released from the world's nuclear power plants to cause human extinction in the near term. In the wake of this horrific conclusion, conservation biologist Guy McPherson proposes we act with compassion, courage, and creativity. He suggests we act with the kind of empathy for which humans are renowned. In other words, he suggests we act with decency toward the humans and other organisms with which we share this beautiful planet. Going Dark is the story of one scientist's response to the horrors we face. It is a deeply personal narrative infused with abundant evidence to support its terrifying claims. In the words of syndicated cartoonist David Fitzsimmons, McPherson's "approach is disarming and his message is both life-changing and convincingly alarming. A blend of Paul Revere with Rachel Carson, Guy McPherson is a significant voice of rational conscience nudging in the wilderness. Fierce as Ed Abbey, and equally prophetic, Professor McPherson is a modern-day John Muir with a global perspective. Beyond the warnings is a body of thoughtful and pragmatic real world ideas." Guy McPherson was a successful professor by every imperial measure: well-published in all the right places, he taught and mentored students who acquired the best jobs in the field, and performed abundant, exemplary professional service. He earned enough to live on a third of his income and still traveled as much as he desired throughout the industrialized world. In other words, McPherson was the perfect model of all that is wrong with the United States and, by extension, the nations looking to us for an example. Rather than questioning the system, he was raising minor questions within the system. During the decade of his forties, McPherson transformed his academic life from mainstream ecologist to friend of the earth. He became a conservation biologist and social critic, and his speaking and writing increasingly targeted the public beyond the classroom. McPherson began teaching poetry in facilities of incarceration, trying to give voice to wise people long marginalized or ignored by industrial society. Guest commentaries in local newspapers pointed out the absurdities of American life, as well as limits to growth for the world's industrial economy. Increasingly strident essays drew the attention of university administrators who tried to fire him, and, when that failed, tried to muzzle him. Both routes proved too difficult to impinge upon a tenured full professor. Shortly after administrators gave up trying to force McPherson's departure from a major research university, he left the institution on his own terms when, at the age of 49, McPherson finally awakened to the costs of the non-negotiable American way of life: obedience at home and oppression abroad. In response, he went back to the land, where he raises goats and gardens and works with his neighbors. Much of the country’s recent population growth is situated beyond the metropolitan fringe, where development consumes millions of acres of privately owned land. Exurbanization has become the dominant pattern of land development in America and there is no indication it will slow in the future. This development depletes agricultural and wildlands, and causes numerous environmental impacts ranging from the loss of biodiversity and wildland habitats to soil erosion, an increase in nonnative species, and the heightened threat to endangered species. Written for regional planners, planning commissions, local elected officials, environmental groups, and the public-at-large, The Planner’s Guide to Natural Resource Conservation provides readers from diverse, nonscientific backgrounds with a working knowledge of how and why exurbanization impacts environmental systems. Contributors include experts in rangeland ecology, restoration ecology, zoology, urban and regional planning, and conservation biology, who highlight the best practices to mitigate environmental problems or to avoid them altogether. Each chapter will leave readers with a firm grasp of relevant concepts and processes, an understanding of current research, and the know-how to apply science to land-use decisions. Adrian X. Esparza is Associate Professor in the School of Natural Resources at the University of Arizona (Ph.D. 1987, University of Illinois-Urbana). He taught previously in the School of Planning, College of Architecture at the University of Arizona. His research focuses on exurban land development in the southwest United States and urbanization in the United States-Mexico border region. He has published dozens of articles in the fields of urban and regional planning and regional science. Fire, both inevitable and ubiquitous, plays a crucial role in North American ecosystems. But as necessary as fire is to maintaining healthy ecosystems, it threatens human lives and livelihoods in unacceptable ways. This volume explores the rich yet largely uncharted terrain at the intersection of fire policy, fire science, and fire management in order to find better ways of addressing this pressing dilemma. Written in clear language, it will help scientists, policy makers, and the general public, especially residents of fire-prone areas, better understand where we are today in regard to coping with wildfires, how we got here, and where we need to go. Drawing on abundant historical and analytic information to shed new light on current controversies, Living with Fire offers a dynamic new paradigm for coping with fire that recognizes its critical environmental role. The book also tells how we can rebuild the important ecological and political processes that are necessary for finding better ways to cope with fire and with other complex policy dilemmas. 2006, Rowman & Littlefield Education, Lanham, Maryland. Young academicians are serious scholars and voracious readers who are perennially in search of practical and inspiring advice about their vocation. Their tenure-driven neuroses, combined with an inherent competitive streak and an understanding of the importance of public service, engender their quest for advice about life in the academy. In Letters to a Young Academic: Seeking Teachable Moments, Guy R. McPherson feeds a sophisticated audience hungry for practical, inspirational, and witty advice. He begins by answering the question, "Why choose academia?," then addresses the fundamental nature of the "life of mind" before addressing questions that deal with the "how" and "what" of teaching. Finally, McPherson turns to issues of career advancement and professional service. Each topics is described in a series of personal letters. This book is a quick read that will evoke laughter, reflection, and contemplation for all young scholars. Has the American Dream Become a Nightmare? Killing the Natives: Has the American Dream Become a Nightmare? thoroughly describes how our indefatigable pursuit of the American Dream - "live long and prosper" - threatens the world's native cultures, languages, and species and ultimately our own civilization. This critical, scholarly assessment is rooted in history, shaped by culture, and bounded by a broad and optimistic vision. It contains pragmatic solutions to important, timely problems. Killing the Natives connects the world of economics, the government, and social justice--three enterprises that are inextricably linked despite the appearance given by laissez-faire economic policies. The intersection of environmental protection, social justice, and the human economy represents rich but essentially uncharted territory. Author Guy R. McPherson explains, in readily accessible language, how we can "wake up" from our self-induced nightmare and stop the massacre. By the beginning of the twenty-first century, few people could deny the reality of global change. But while most alarm has been over increasing temperatures, other changes are occurring in precipitation patterns—variations that may be due in part to global warming but also to factors such as changes in atmospheric circulation and land surfaces. This volume provides a central source of information about this newly emerging area of global change research. It presents ongoing investigations into the responses of plant communities and ecosystems to the experimental manipulation of precipitation in a variety of field settings—particularly in the western and central United States, where precipitation is already scarce or variable. By exploring methods that can be used to predict responses of ecosystems to changes in precipitation regimes, it demonstrates new approaches to global change research and highlights the importance of precipitation regimes in structuring ecosystems. The contributors first document the importance of precipitation, soil characteristics, and soil moisture to plant life. They then focus on the roles of precipitation amount, seasonality, and frequency in shaping varied terrestrial ecosystems: desert, sagebrush steppe, oak savanna, tall- and mixed-grass prairie, and eastern deciduous forest. These case studies illustrate many complex, tightly woven, interactive relationships among precipitation, soils, and plants—relationships that will dictate the responses of ecosystems to changes in precipitation regimes. The approaches utilized in these chapters include spatial comparisons of vegetation structure and function across different ecosytems; analyses of changes in plant architecture and physiology in response to temporal variation in precipitation; experiments to manipulate water availability; and modeling approaches that characterize the relationships between climate variables and vegetation types. All seek to assess vegetation responses to major shifts in climate that appear to be occurring at present and may become the norm in the future. 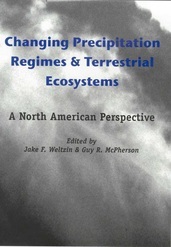 As the first volume to discuss and document current and cutting-edge concepts and approaches to research into changing precipitation regimes and terrestrial ecosystems, this book shows the importance of developing reliable predictions of the precipitation changes that may occur with global warming. These studies clearly demonstrate that patterns of environmental variation and the nature of vegetation responses are complex phenomena that are only beginning to be understood, and that these experimental approaches are critical for our understanding of future change. 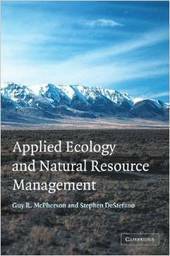 This volume bridges the gap between ecology and natural resource management and, in particular, focuses on plant ecology as a foundation for vegetation and wildlife management. It describes how concepts and approaches used by ecologists to study communities and ecosystems can be applied to their management. Guy R. McPherson and Stephen DeStefano emphasize the importance of thoughtfully designed and conducted scientific studies to both the advancement of ecological knowledge and the application of techniques for the management of plant and animal populations. Savannas are ecosytems with a continuous grass layer and scattered trees or shrubs. These lands occupy nearly a third of the earth’s land surface and are an important resource not only in world economies but also as repositories of biodiversity. Because savannas are generally thought of as tropical ecosystems, most reviews of the literature have tended to disregard savannas found in temperate zones. Yet these ecosystems are both extensive and diverse in North America, ranging from longleaf pine habitats along the Atlantic coastal plain to xeric piñon-juniper communities of the Great Basin-ecosystems seemingly disparate, yet similar enough to merit study as savannas. This book provides an overview of the patterns and processes shared by these ecosystems and offers substantive ideas regarding future management and research efforts. 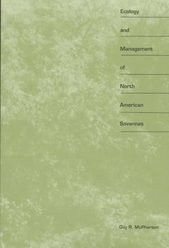 It describes the composition geographic distribution, climate, soils, and uses of savannas throughout North America, summarizing and integrating a wide array of literature. While discussing these ecological patterns and processes. McPherson develops a framework for implementing management practices and safeguarding the future of these important wildland ecosystems. Ecology and Management of North American Savannas takes a major step toward establishing the science of savanna ecology for North America. It encourages constructive debate and relevant research on these important systems and will also serve as a useful resource in biogeography, plant ecology, and rangeland management.